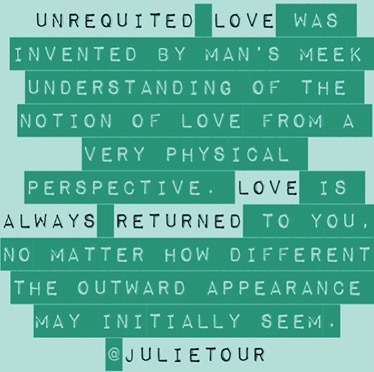 Unrequited love does not exist in our universe. Consider the text book definition. The dictionary defines unrequited as “not reciprocated or returned in kind.” I am already hearing the cries, “But Johnny didn’t love me!” or “I was never good enough for him!” or better yet, “She never even noticed me.” I still stand by my statement that unrequited love is a myth in this universe.